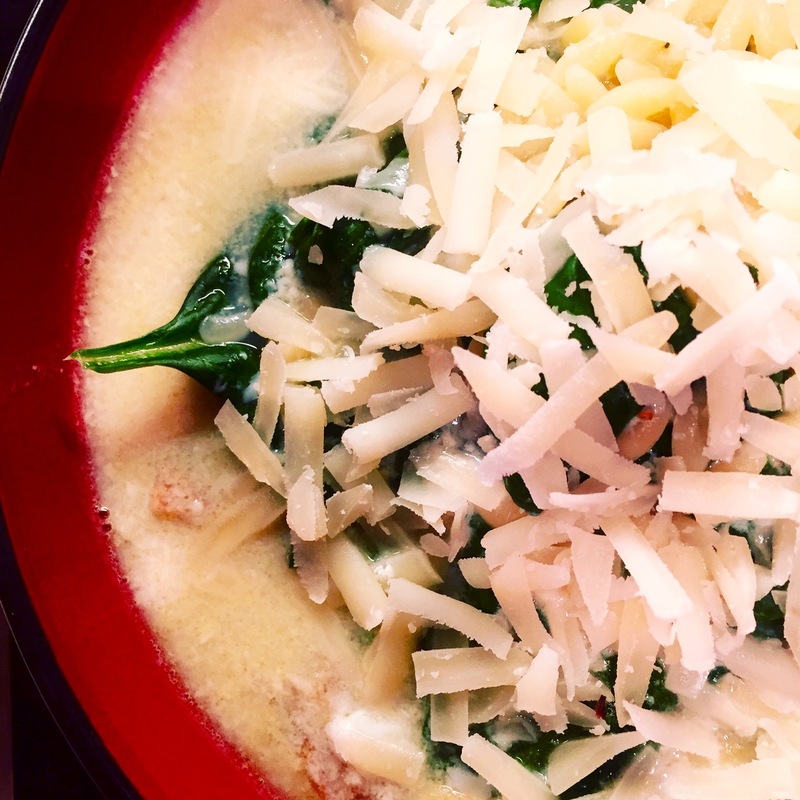 This garlic spinach soup is my new favorite thing for a fall weeknight. It uses ingredients I almost always have on hand – garlic, bread, eggs, spinach – plus some dried herbs and grated Parmesan or Gruyere cheese. I run in the door, put the water on to boil, change my clothes, and proceed with the recipe. It doesn’t seem like something so simple would be good, but it is simply delicious! You simmer rather a lot of garlic plus some dried herbs to make a clean broth, add some small pasta such as orzo, toss in some spinach or frozen peas, then swirl in some eggs to add protein and body. To serve, ladle it over some hearty, garlicky toasted bread in the bottom of each bowl. Voilá! This recipe is based on another winner from Martha Rose Shulman in the New York Times – I didn’t modify the original recipe too much other than to use spinach instead of frozen peas and a little less salt. She makes the point that you can use almost any veggie you have on hand – very handy for that sad bunch of something you might have forgotten about, no longer beautiful but still edible. Garlic soup could be its destiny! Equipment: 3 to 4 quart pot with lid. Make the broth: Bring 6½ c. water to a boil in a 3- or 4-quart saucepan. Add minced or pressed garlic, salt, bay leaf, and thyme. Cover and simmer 15 minutes. Taste and adjust salt. Remove bay leaf. Prepare the soup: Add pasta to pot. Stir, cover, and simmer for time indicated on package, until al dente, stirring occasionally. If using frozen peas, add when pasta is done and simmer 5 minutes. If using spinach, just stir it in towards the end. Prepare the toast: Meanwhile, toast the bread. When done, rub each piece of toast with the halved garlic clove, then cut into bite-sized pieces and place 2 slices in the bottom of each bowl. Assemble the soup: Beat together the eggs and olive oil. Temper the egg by spooning 2 ladlefuls of the hot soup into the eggs and stirring. Turn off heat under soup and slowly stir in tempered egg mixture. Add ground pepper and taste one final time for salt, adjusting if needed. Ladle soup into bowls over toast, sprinkle cheese over the top, and serve, Enjoy! !